de Camp, L. Sprague. Aristotle and the Gun and Other Stories . Five Star 2002. De Camp, L. Sprague. "Aristotle and the Gun"
What if: Aristotle abandoned the study of natural science. Summary: Trying to teach Aristotle the scientific method, a time traveler instead overawes and sours him on scientific research. Published: In Astounding , February 1958; Gun for Dinosaur and Other Imaginative Tales , Doubleday 1963; Alpha 3 (ed. Robert Silverberg), Ballantine 1972 (034502883X); Analog: Writer's Choice, vol. 1 (ed. Stanley Schmidt), Davis/Dial 1983 (0385279132); Space Mail Vol. II (eds. Isaac Asimov, Martin H. Greenberg and Joseph Olander), Fawcett 1982 (0449244814); Robert Adams' Book of Alternate Worlds (eds. Robert Adams, Martin H. Greenberg, and Pamela Crippen Adams), q.v. ; The Legend Book of Science Fiction (ed. Gardner Dozois), Legend 1991 (0712650105, 0712648615), v.t. Modern Classics of Science Fiction , St. Martin's 1992 (0312072384BUY), St. Martin's 1993 (0312088477BUY); Roads Not Taken: Tales of Alternate History (eds. Gardner Dozois and Stanley Schmidt), q.v. 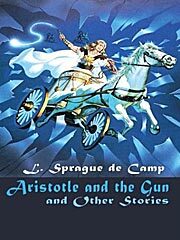 ; Aristotle and the Gun and Other Stories , Five Star 2002 (0786243112BUY); Years in the Making: The Time-Travel Stories of L. Sprague de Camp (ed. Mark L. Olson), NESFA 2005 (1886778477BUY); and Futures Past (eds. Jack Dann and Gardner Dozois), q.v. Translation: German by Werner Fuchs as "Ein Yankee bei Aristoteles", in Ein Yankee bei Aristoteles , Heyne 1980.